BRISTOL- Ever since Mike Reynolds was in 4th grade, he knew he wanted to be a school teacher. In the summer of 2018, it was announced that Mike Reynolds, a social studies 6th grade teacher at Chippens Hill Middle School, was to be Bristol’s 2019 Teacher of the Year recipient. Not only was Reynolds elated, but so were his students. 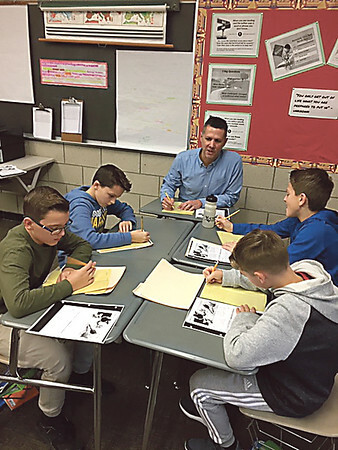 When he’s not teaching 6th graders about ancient Rome and the Middle East, Reynolds partakes in several leadership roles throughout Chippens Hill and the Bristol education community. Reynolds is the middle school social studies curriculum coordinator, 6th grade Orange Team leader, vice president for the Teachers Union for Middle Schools, and is a member of the Positive Behavior Intervention Support and the Greater Bristol Labor Council. One of Reynolds main goals for the 2019 year is to incorporate more small group activities with his students and to create a positive environment to help motivate his students. When he first became a teacher almost 20 years ago, Reynolds realized there was a lot of work that had to be done. Reynolds encourages his students to change and adapt; Reynolds feels like it’s an important life skill to have. “We like to mix things up in the classroom. The kids are constantly sitting in different pairs, different groups or choosing groups. I tell them that as they get older, they’re going to have different teachers, different students and different jobs. It’s important for them to learn how to work together and get along with the community,” said Reynolds. Posted in The Bristol Press, Bristol on Friday, 1 February 2019 20:58. Updated: Friday, 1 February 2019 21:00.